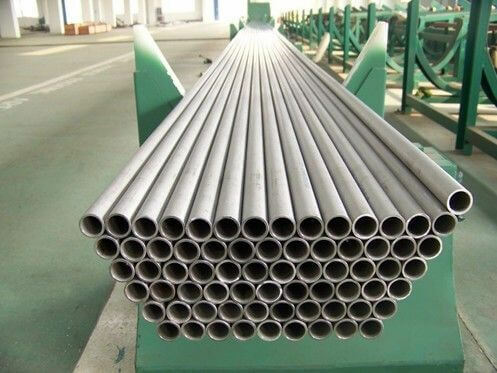 347 Stainless Steel is variant of the basic austenitic 18/8 Grade 304 with added Columbium - the introduction of Columbium stabilizes the steel and eliminates carbide precipitation which subsequently causes intergranular corrosion. The steel has excellent forming and welding qualities and excellent toughness even at cryogenic temperatures. Both 347/347H are used primarily in elevated temperature applications. Alloys 321 (S32100) and 347 (S34700) are stabilized stainless steels which offer as their main advantage an excellent resistance to intergranular corrosion following exposure to temperatures in the chromium carbide precipitation range from 800 to 15000F (427 to 8160C). Alloy 321 is stabilized against chromium carbide formation by the addition of titanium. Alloy 347 is stabilized by the addition of columbium and tantalum. While Alloys 321 and 347 continue to be employed for prolonged service in the 800 to 15000F (427 to 8160C) temperature range, Alloy 304L has supplanted these stabilized grades for applications involving only welding or short time heating. 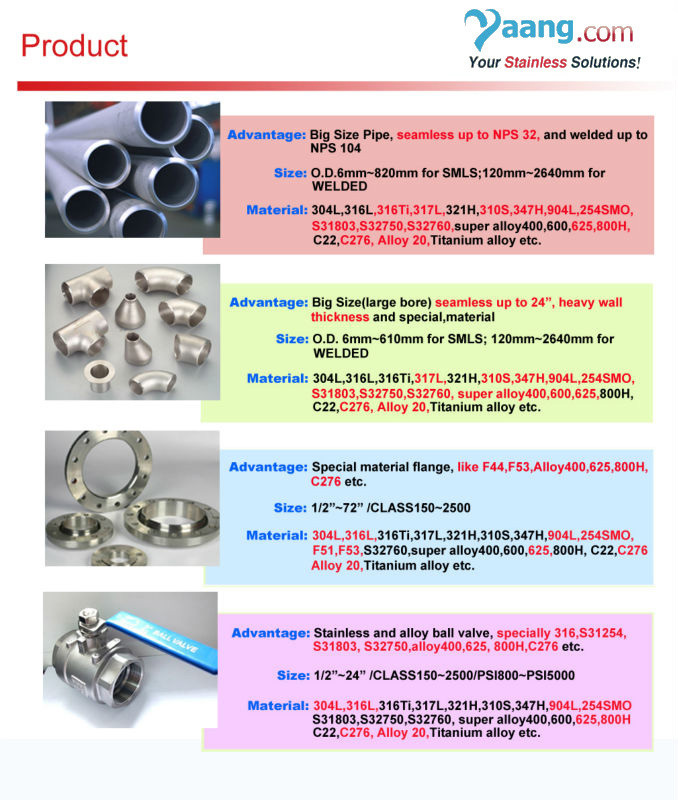 Alloys 321 and 347 stainless steels are also advantageous for high temperature service because of their good mechanical properties. Alloys 321 and 347 stainless steels offer higher creep and stress rupture properties than Alloy 304 and, particularly, Alloy 304L, which might also be considered for exposures where sensitization and intergranular corrosion are concerns. This results in higher elevated temperature allowable stresses for these stabilized alloys for ASME Boiler and Pressure Vessel Code applications. The 321 and 347 alloys have maximum use temperatures of 15000F (8160C) for code applications like Alloy 304, whereas Alloy 304L is limited to 8000F (4260C). High carbon versions of both alloys are available. These grades have UNS designations S32109 and S34709. Represented by ASTM A240 and ASME SA - 240 specifications. Alloys 321 and 347 offer similar resistance to general, overall corrosion as the unstabilized chromium nickels Alloy 304. Heating for long periods of time in the chromium carbide precipitation range may affect the general resistance of Alloys 321 and 347 in severe corrosive media. 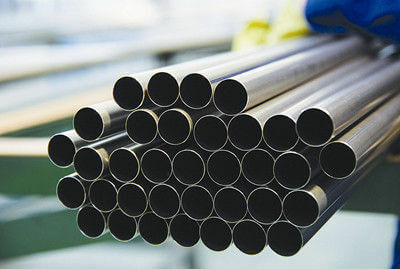 In most environments, both alloys will show similar corrosion resistance; however, Alloy 321 in the annealed condition is somewhat less resistant to general corrosion in strongly oxidizing environments than annealed Alloy 347. For this reason, Alloy 347 is preferable for aqueous and other low temperature environments. Exposure in the 8000F to 15000F (4270C to 8160C) temperature range lowers the overall corrosion resistance of Alloy 321 to a much greater extent than Alloy 347. Alloy 347 is used primarily in high temperature applications where high resistance to sensitization is essential, thereby preventing intergranular corrosion at lower temperatures. The physical properties of Types 321 and 347 are quite similar and, for all practical purposes, may be considered to be the same. The values given in the table may be used to apply to both steels. When properly annealed, the Alloys 321 and 347 stainless steels consist principally of austenite and carbides of titanium or columbium. Small amounts of ferrite may or may not be present in the microstructure. Small amounts of sigma phase may form during long time exposure in the 10000F to 15000F (5930C to 8160C) temperature range. The stabilized Alloys 321 and 347 stainless steels are not hardenable by heat treatment. The overall heat transfer coefficient of metals is determined by factors in addition to thermal conductivity of the metal. In most cases, film coefficients, scaling, and surface conditions are such that not more than 10 to 15% more surface area is required for stainless steels than for other metals having higher thermal conductivity. The ability of stainless steels to maintain clean surfaces often allows better heat transfer than other metals having higher thermal conductivity. Minimum mechanical properties of the stabilized Alloys 321 and 347 chromium - nickel grades in the annealed condition (20000F [10930C], air cooled) are shown in the table. Typical elevated temperature mechanical properties for Alloys 321 and 347 sheet/strip are shown below. Strength of these stabilized alloys is distinctly higher than that of non - stabilized 304 alloys at temperatures of 10000F (5380C) and above. High carbon Alloys 321H and 347H (UNS32109 and S34700, respectively) have higher strength at temperatures above 10000F (5370C). ASME maximum allowable design stress data for Alloy 347H reflects the higher strength of this grade in comparison to the lower carbon Alloy 347 grade. The Alloy 321H is not permitted for Section VIII applications and is limited to 8000F (4270C) use temperatures for Section III code applications. The annealing temperature range for Alloys 321 and 347 is 1800 to 20000F (928 to 10930C). While the primary purpose of annealing is to obtain softness and high ductility, these steels may also be stress relief annealed within the carbide precipitation range 800 to 15000F (427 to 8160C), without any danger of subsequent intergranular corrosion. Relieving strains by annealing for only a few hours in the 800 to 15000F (427 to 8160C) range will not cause any noticeable lowering in the general corrosion resistance, although prolonged heating within this range does tend to lower the general corrosion resistance to some extent. As emphasized, however, annealing in the 800 to 15000F (427 to 8160C) temperature range does not result in a susceptibility to intergranular attack.For maximum ductility, the higher annealing range of 1800 to 20000F (928 to 10930C) is recommended.